In case you hadn't noticed, AME was long over due for face lift. As proud as I was being capable of coming up with a quick makeshift banner, button and generic layout for the blog - it seriously needed a professional touch. Design is not my niche and I am totally confused when it comes to HTML other than a simple copy and paste the code. You could probably tell by the giant social media buttons I had on the left side before - I admit it, they were ugly. AME has been around for three years and not much had changed, it was time for a serious overhaul! Being part of a fantastic and helpful blogging group CBN means knowing some fantastic friends and that's where Jodi from Rants Designs came to my rescue! 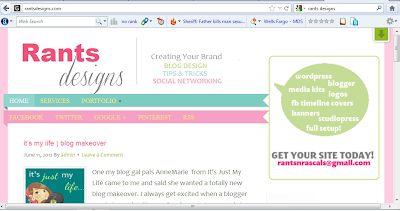 I noticed she had mentioned she did blog designs on top of running her blog RantsnRascals and I started seriously thinking it was time for a change. Initially only had questions but she had a vision for AME. The changes happened literally over the weekend and I couldn't be happier with the results. She changed up everything from top to bottom and even created something for the Facebook fanpage (coming soon). What brought me to Jodi (besides being the awesome person that she is) was the work she does. I have seen the magic she can make with fellow bloggers blogs, banners, buttons, media kits, facebook pages and so on, all the important aspects we as bloggers need to make sure is shiny and new to attract you lovely readers - and represent our brands in a professional atmosphere. If you are a blogger or own a website and need someone reliable to design you an awesome template and more that will suit both your personality and your blog, visit Rants Designs website to check out the samples they have on site. Thank you once again Jodi for all your hard work putting together this amazing new look for AME! You can find Jodi on Twitter @rantsnrascals! Disclosure: Posted by AME as a thank you to Jodi from Rants Designs for creating an amazing new look for the blog. Opinions and comments on this blog are those of the author. Toys R Us Celebrates Schools Out with Kids Day! Toys R Us & Airmiles Team Up! PTPA Summer 2012 Winners Announced! Exciting news! We are expecting! Get out and play with Ontario Fun Pass!